PLEASE - If you live on the south side of Chicago, do not call the north side number, as we represent different companies. If we don't answer the phone, just leave a message, and we'll get back to you. Between the two companies, we service all of Greater Chicago, north and south, including downtown and the towns of Aurora, Naperville, Schaumburg, Buffalo Grove, Elk Grove Village, Des Plaines, Northbrook, Glenview, Skokie, Elmwood Park, Oak Park, Burbank, Oak Lawn, Calumet Park, Harvey, Oak Forest, Tinley Park, Orland Park, Matteson, Joliet, Palos Hills, Dolton, Markham, Midlothian, Chicago Heights, Homer Glen, Frankfort, Crest Hill, and surrounding areas. We also service Lake County and North Chicago, Waukegan, and surrounding areas. We will travel further distances for larger wildlife control projects, such as bat colony removal. We operate 24 hours a day, 7 days a week. We know that a wildlife emergency can happen at any time, even the middle of the night, and so we answer the phone at all times. We work 7 days a week - animals don't take weekends, and neither do we. If an animal is causing a problem on a Sunday evening, no problem. 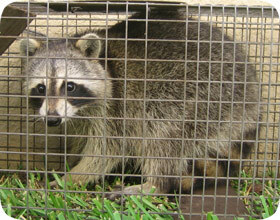 When we set traps at your home, of course we will come on the weekend to remove a trapped animal. We would never let an animal remain in a trap suffering. We are very humane to all the wildlife that we deal with. 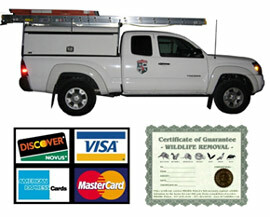 We are fully licensed and insured. We arrive in marked work trucks and in uniform, and give every customer a written contract with guarantee that we stick by. We accept all forms of payment, including all major credit cards. These are the most common types of wildlife scenarios that we deal with: Squirrels in attics, raccoons in attics, skunks under a porch or shed, bats in buildings, rat infestations, pigeon problems, and trouble with nuisance raccoons / opossums, such as dangerous animals or critters causing property damage. We are especially adept at Chicago rat control, where other companies fail. The other mouse and rat extermination companies use ineffective techniques such as poison, which never solves the problem - it only allows them to keep their never-ending monthly or quarterly service contracts. We take care of rats permanently, just like we do with every other type of wild animal, by blocking access into the building, and trapping and removing all the animals. Our method is the only method that keeps the rats out for good, and we guarantee our work. We have you rat-free usually in little more than a week. We are not a typical Chicago pest control company. We focus exclusively on wild animals, not insects like termites or cockroaches. We never use poison, and we are not a Chicago exterminator company - we are nuisance wildlife control specialists, dealing only with mammals and birds and the occasional reptile. We most commonly deal with raccoons, rats and mice, squirrels, pigeons, bats, and skunks, and sometimes other animals such as opossums. We are very humane to all the wildlife that we trap and remove, and we always work toward a permanent solution to wildlife problems, including prevention and damage repairs. Give us a call at any time, and we will discuss your wildlife issue, quote a price, and schedule a same-day or next-day appointment. Give us a call 24/7 to discuss your animal trapping and wildlife control needs in Chicago IL today!